Watermelon Cherry Limeade – a deliciously refreshing summertime drink – a mix of watermelon juice, sparkling cherry juice, and lime. Watermelon has long been my most favorite summertime treat. A perfectly ripe, juicy, red watermelon is one of life’s perfect delights! Enjoying that delicious, sweet watermelon with the juice dripping down your arms was a childhood joy in my little southern home town. 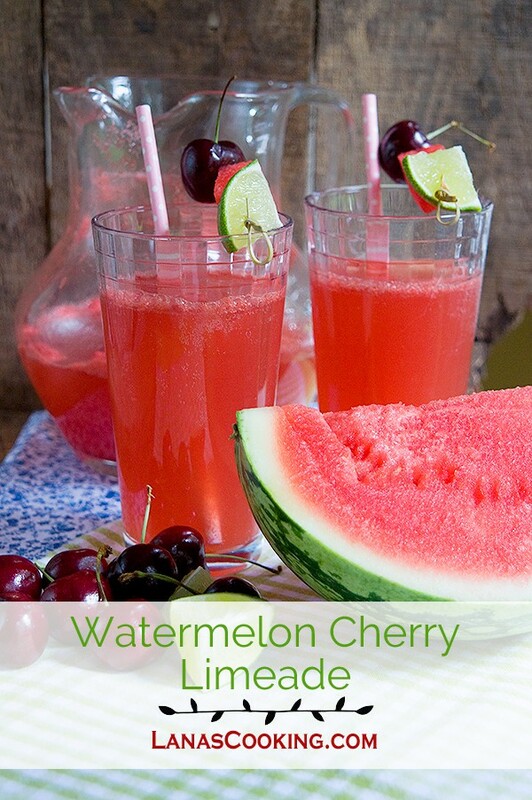 How better to remember those days than with a cold, delicious drink like my Watermelon Cherry Limeade. 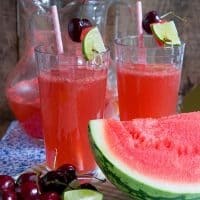 This delicious beverage of watermelon juice, sparkling cherry juice, and lime, this beverage is perfect for summer parties or just afternoon sipping. Even though watermelons weren’t a major cash crop where I grew up, most people grew them in their gardens. Daddy would sometimes bring four or five at a time home during the height of the season. We’d put them in the fridge or just under the air conditioner so they’d be nice and cool when we were ready for them. During the hot late afternoon, Mama would put us all around the picnic table in the back yard and cut open one of those beautiful watermelons. We’d eat until our faces and hands were sticky and we couldn’t manage one more bite. I liked mine plain, but my Daddy always had salt on his. Just a little way up the road from where I grew up is Crisp County. Located in southwest Georgia, Crisp County is the state’s foremost watermelon-growing county and the number 4 watermelon-growing county in the United States. Crisp County growers produce primarily seedless, red watermelons. The city of Cordele, located in Crisp County, is known as the Watermelon Capital of the World because of the quality and quantity of watermelons grown there. Their local farmer’s market is a major watermelon shipping point. Each summer, Cordele celebrates the harvest with the Watermelon Days Festival. If you ever find yourself in southwest Georgia during late summer, be sure to try one of the locally grown watermelons. They’re absolutely mouth-wateringly delicious! 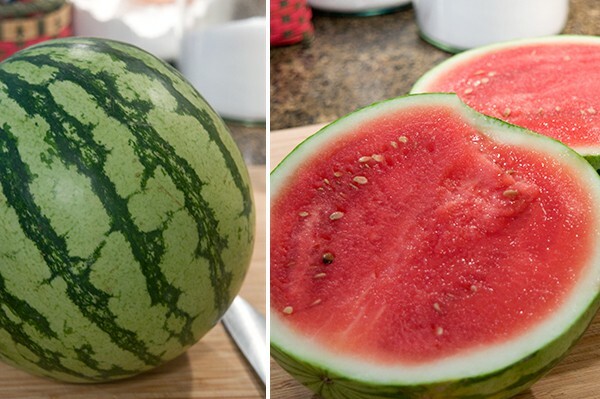 Halve or quarter the watermelon and cut the flesh from the rind. 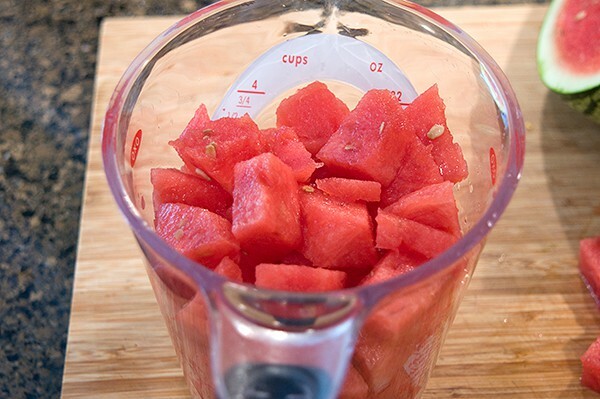 Cut the watermelon flesh into about 1-inch cubes. 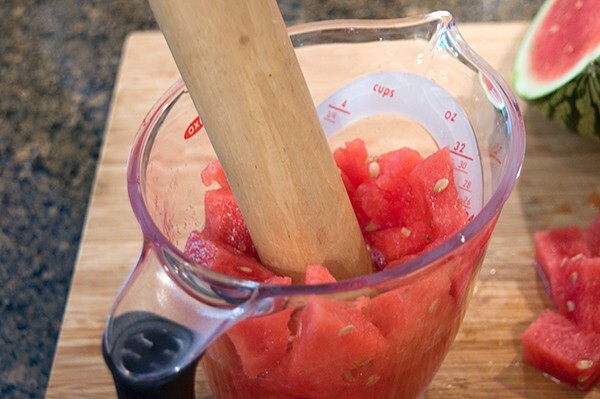 Muddle or crush the watermelon cubes to extract as much juice as possible. Since I don’t happen to have a muddler, I just used an old rolling pin with blunt ends. You could also use a wooden spoon or something similar. 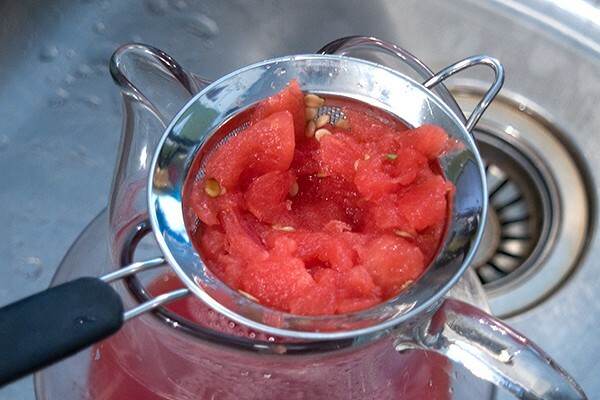 Keep pressing or muddling until the watermelon has broken down and yielded its juice. 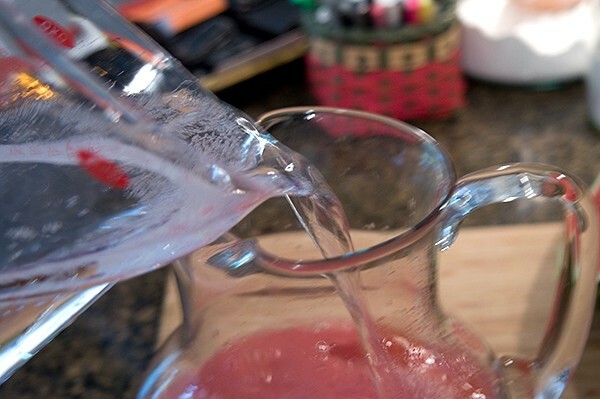 Strain the juice into a pitcher. 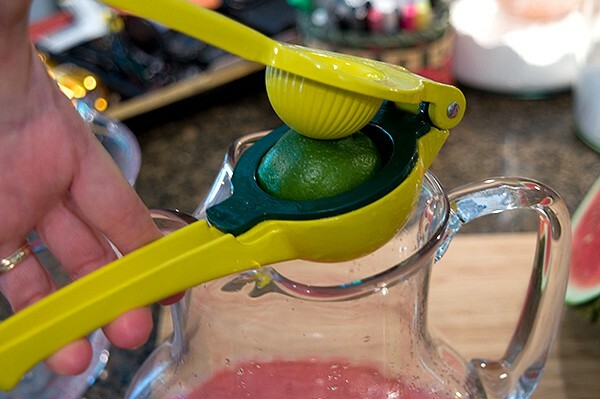 Do it a little at a time pressing against the strainer to get the maximum amount of juice. Discard the pulp. Cover and chill for 2 hours or overnight. Some of the bubbly foam will settle out but not all. It doesn’t matter to me, because it’s so pretty! Pin to Your Pinterest Beverage Board! 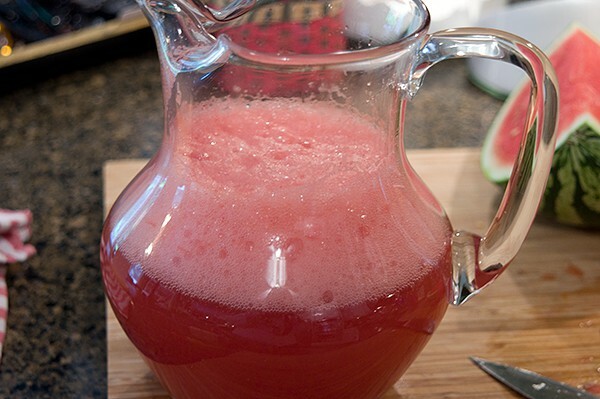 Deliciously refreshing summer time drink - a mix of watermelon juice, sparkling cherry juice, and lime. 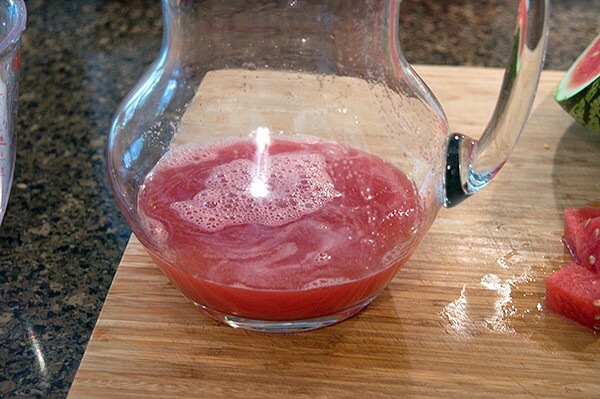 Muddle or crush the watermelon cubes to extract as much juice as possible. 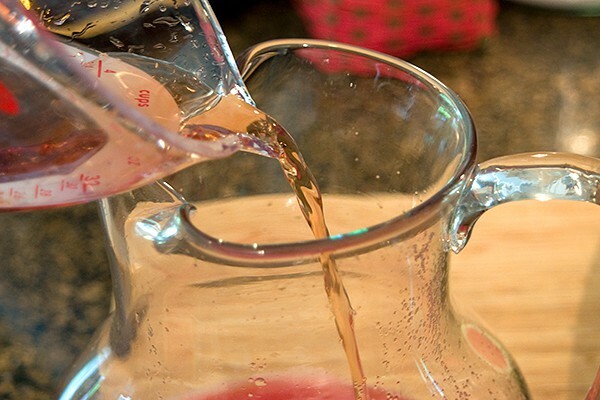 Strain into a pitcher. Cover and chill for 2 hours or overnight. Ooooh! That looks absolutely wonderful. In addition to being delicious, watermelon is a very good source of vitamin C. It is also a good source of pantothenic acid, copper, biotin, potassium, vitamin A (in the form of carotenoids), vitamin B1, vitamin B6 and magnesium. So healthy for you. It’s refreshing and delicious. Folks should really drive through Crisp County during the watermelon harvest time. It’s like a coordinated ballet to see the fellows throw watermelons from the field to the fellows in the trucks. They do it with a rhythm that is fascinating. Thanks for the recipe. I am inspired.